Humans are capable of producing the fatty acids we need in our bodies, except for two essential fatty acids: omega-3 and omega-6. These two are considered to be essential because we cannot produce them ourselves, rather, we have to obtain them by consuming food. They are both needed for growth and repair within our bodies and can readily be found in plant-based sources. Omega-3 and omega-6 fatty acids are important in the normal functioning of all tissues of the body. Deficiencies are responsible for a host of symptoms and disorders including abnormalities in the liver and kidney, changes in the blood, reduced growth rates, decreased immune function, depression, and skin changes, including dryness and scaliness. Adequate intake of the essential fatty acids results in numerous health benefits. Prevention of atherosclerosis, reduced incidence of heart disease and stroke, and relief from the symptoms associated with ulcerative colitis, menstrual pain, and joint pain have also been documented. While supplements and added oils are not typically necessary in the vegetarian diet, good sources of omega-3 and omega-6 fats should be included daily. It is important to take these two fats in the proper ratio as well. Omega-6 fatty acids compete with omega-3 fatty acids for use in the body, and therefore excessive intake of omega-6 fatty acids can be a problem. The U.S. diet has become heavy in omega-6 fats and low in omega-3 fats, due to a reliance on processed foods and oils. It is necessary to balance this by eating a low-fat diet that is low in processed foods and with fat mainly coming from omega-3 fatty acids. Omega-6 fats are found in leafy vegetables, seeds, nuts, grains, and vegetable oils (corn, safflower, soybean, cottonseed, sesame, sunflower). Most diets provide adequate amounts of omega-6 fatty acids. It is important for vegetarians to include foods that are rich in omega-3 fatty acids on a daily basis. Alpha-linolenic acid, a common omega-3 fatty acid, is found in many vegetables, beans, nuts, seeds, and fruits. The best source of alpha-linolenic acid is flaxseeds or flaxseed oil. Flaxseed oil and ground flaxseeds are particularly good choices to meet your needs for omega-3 fatty acids. One teaspoonful of flaxseed oil or a tablespoonful of ground flaxseed will supply the daily requirement of alpha-linolenic acid. To protect it from oxygen damage, flaxseed oil or ground flax seed must be stored in the refrigerator or the freezer. Use a little in dressings for salads or baked potatoes. Don't try to cook with this oil, however, as heat damages its omega-3s. For you to absorb what you need from flaxseeds, they must be ground. Simply put fresh flaxseeds in a spice or coffee grinder for a few seconds. Some people grind a cup every week or so and store it in the freezer. A spoonful can be added to a smoothie or sprinkled on breakfast cereal, a salad, or other dish. 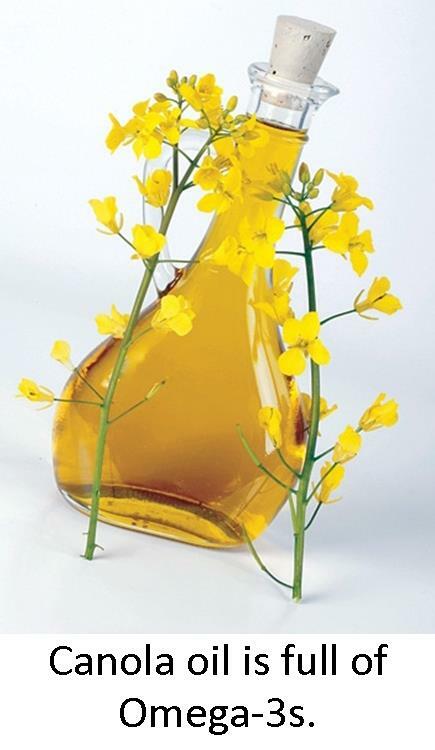 For those seeking to increase their intake of omega-3 fats, more concentrated sources can be found in oils such as canola (also known as rapeseed), soybean, walnut, and wheat germ. Omega-3 fatty acids can be found in smaller quantities in nuts, seeds, and soy products, as well as beans, vegetables, and whole grains. Corn, safflower, sunflower, and cottonseed oils are generally low in omega-3s. Fish for Essential Fatty Acids? Some people may have heard that fish are good sources of essential fatty acids. However, the high amounts of fat and cholesterol and the lack of fiber make fish a poor choice. Fish are also often high in mercury and other environmental toxins that have no place in an optimal diet. Fish oils have been popularized as an aid against everything from heart problems to arthritis. The bad news about fish oils is that omega-3s in fish oils are highly unstable molecules that tend to decompose and, in the process, unleash dangerous free radicals. Research has shown that omega-3s are found in a more stable form in vegetables, fruits, and beans. Whether you are interested in promoting cardiovascular health, ensuring the proper growth and development of your child, or relieving pain, a vegetarian diet rich in fruits, vegetables, nuts, seeds, and legumes can help you achieve adequate intake of the essential fatty acids.